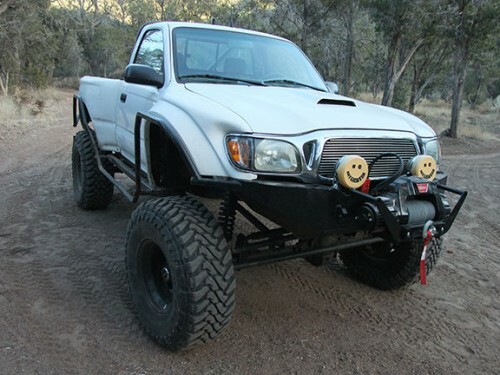 For your kind consideration, we are offering a sweet head turning street cruiser, an ultimate offroad rock crawler! This is a truly amazing vehicle we got from a supportive friend, but we needed a rig that holds the whole family. $36,000 invested, with receipts for everything, and every part and bolt new! We dearly LOVE this truck, but need a special rig that can hold the whole family. Make a cash or trade offer! Will consider trade for a custom built JK, diesel truck, H2, Roadster, C6, sports convertible, or part trade for quality firearms, or a newer model Grizzly or Rancher ATV. 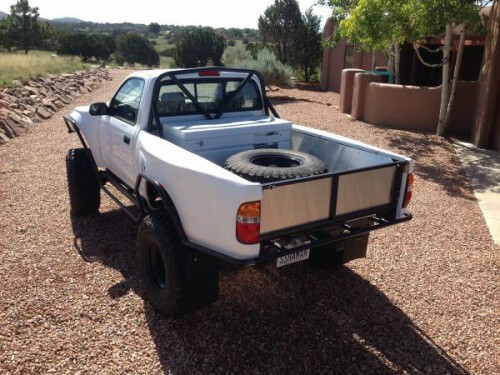 This is an all Newly-Built Tacoma, clean, pristine, bulletproof. Started as a 2001, then was completely customized and rebuilt like none other, completed with new parts in 2015. New supercharged engine. Custom body and suspension, lifted. 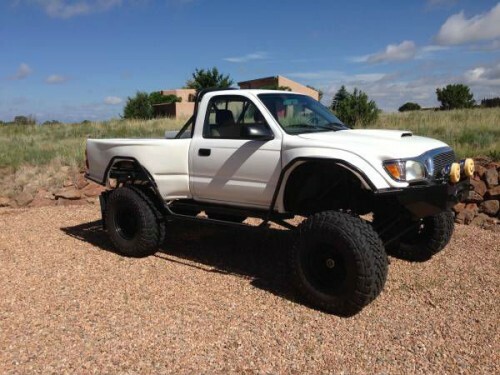 2001/2015 White Tacoma 2.7 perched on top of big truck undercarriage, 8″ lift. Built for Show, SEMA. Totally rebuilt engine. New alternator. All work done right at professional shops. Every inch of it gone over by the pros. Rebuilt at 89,812, only 4,514 miles put on it since the engine overhaul and all of the following modifications contributed to by Central Coast 4WDrive in Santa Cruz California (gears, bearings, etc. ), JJ’s Fabrication in Davenport California (axles, brakes, tubing) and Ernie’s Service Center in Felton, California (engine overhaul). Front suspension: 3-link with 18 inch ballistic piggyback coil over shocks. Put it on a lift and the wheel just pretty must stays down on the shop floor… long reach! Lever-lock line lock hydraulic parking brake. Will consider trade for a custom built JK or TJ, diesel truck, H2, Roadster, C6, sports convertible, or part trade for quality firearms, or a newer model Grizzly or Rancher ATV. We’re NE of Phoenix in the White Mt. area, Phoenix is the closest city to us.